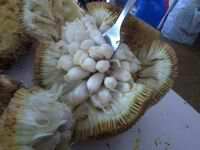 Have YOU ever eaten the Palawan Marang Fruit? 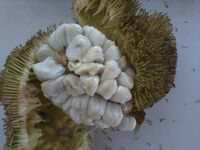 Succulent, yummy, different texture barely begins to describe the Palawan Marang Fruit! If you try no other fruit, DON’T miss this one! Don’t be fooled thinking it’s not good by how it looks below! This fruit will amaze you in how GREAT it tastes! Want to try an incredibly delicious fruit called Marang? The Marang tastes very good! The picture does the Marang injustice! You MUST try this fruit if you ever visit Asia! The Marang ready to eat! Grab your fork and dig in! The Madong or Marang: Nature’s Marshmallow! I rode my mountain bike to the market this morning on August 2nd, 2014 to buy this local fruit that totally rocks! 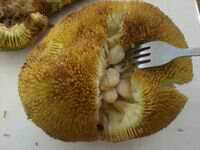 It’s called Marang or Madang. I got 3 of them. I ate them all in one sitting! Now I’m eyeballing the other exotic fruits I bought also. I’ll write about those later on different pages of our website. One of the other types of fruit I purchased, I’ve never seen or eaten before. I had a sample at the market and was instantly hooked! It’s called Cempedak! But that fruit will be discussed with a video on a different page! Back over to you, Madang! Watch our video below of Jeff describing with excitement his enjoyment of the Palawan marang fruit! 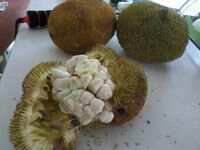 Grace’s account of the Marang fruit in Palawan below. The Marang fruit in Palawan came from Mindanao. It was introduced by the Palawan Integrated Area Development Project (PIADP) under the Palawan Council for Sustainable Development (PCSD) Office, as part of its activities to increase agricultural and forest productivity in the province. When I got here in 1988 fruits in Palawan were scarce. Even banana, a tropical fruit and very common in the whole island in the Philippines cost a lot compared to other places I visited in the country. When I first saw Marang in one of the fruit stands along the sidewalks of Puerto Princesa City it cost Php90.00 per kilo, and that was already in year 2000. It came as a shock to me because I grew up in Mindanao and we only pay Php3.00 to Php5.00 each. But now, marang is gaining its popularity to the locals and tourists at a more affordable price of Php20.00 per kilo. If you desire to learn more about this fruit check out the article about Marang on Wikipedia. You can find the Marang Fruit in the Old Market or New Market. The old market is located in downtown Puerto Princesa City. The New Market is just north of Robinsons Supermarket. Ask just about anyone and they’ll tell you how to get to either market. Do you dream about visiting Palawan? On a tight budget and really don’t think you have enough money to visit Palawan? Or do you have enough money to visit Palawan on the cheap or in luxury? Simply subscribe below to receive updates where we share with you our journeys around Palawan where we enjoy the great tasting Marang Fruit!